I came across the book, Mau Moko, by Ngahuia Te Awekotuku, et al., with new photography by Becky Nunes, University of Hawai'i Press, 2007, while at work the other day. 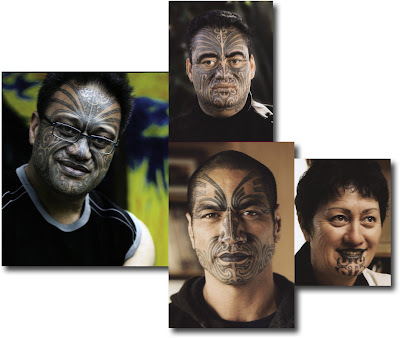 It is a about Maori tattoo in the past and present. I have always loved to draw faces and the additional lines of the tattoos adds a very different dimension to the face. What especially intrigues me is the dark lips. 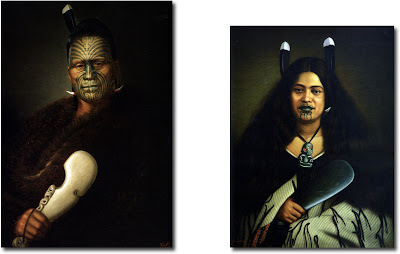 Above: Tawhiao Potatau Te Wherowhero, the Second c. 1885 and Pare Watene of Ngati Maru, c. 1878; both paintings by Gorrfried Lindauer. The Maori tattoo are amazing aren't they.